A gentleman who has been over the battlefield where the abolition forces were recently routed, says that one of the captured wagons containing boxes holding 500 pairs of handcuffs, the cases being labled “for officers.” The enemy sought to relieve themselves of the infamy of carrying such impliments of war, but the above fixes the fact upon them. Noting would make the creaturs opposed to us ashamed of any one of their measures, but the above is one as entirely new and novel in the annals of war as it is infamous to those who sought to use it. Truly the bitter chalice is held to their own lips with a vengeance. For more on Handcuffs and Bull Run, click here. July 19 – News arrived today of the battle at Manassas Junction, which lasted four hours & a half in which the Federalists were severely beaten with great loss, while ours was very slight. July 22 – The telegraph this morning announces a great and glorious victory gained yesterday at Bull’s Run after ten hours hard fighting. The enemy were completely routed, with tremendous slaughter; the loss on either side is of course not yet known, but ours is light compared to theirs. They have besides lost the whole of the celebrated Sherman’s Battery, two or three others, and a quantity of ammunition, baggage, etc. Their whole force amounted to about 80,000 while ours was only 35,000; only our left wing, however, command by Gen. Johnson, 15,000 against 35,000 of the enemy, were mostly engaged. The entire commanded by the President, who arrived on the field about noon, & the right wing, led by Beauregard, were only partially engaged. The Georgia Regiment commanded by Col. Francis S. Bartow seems to have suffered very severely, the Oglethorp Light I. [nfantry] from Savannah especially. Col. Bartow was killed and also Gen. Barnard Bee and Col. B. F. Johnson of the Hampton Legion. The latter arrived only three hours before the battle and seem to have taken conspicuous part in it. In Gen. Bee the Confederate Army lost an officer whose place cannot readily be supplied. He stood so high in his profession that, immediately after his arrival quite late from the distant western frontiers, a captain, he was raised to the rank of Brigadier General; he was one of Carolina’s noblest sons, and, though we glory in the victory won by the prowess of our gallant men, tears for the honored dead mingle with our rejoicings. Col Bartow was one of the most talented and prominent men in Savannah and very much beloved; he left Congress to go to Va. with the O. [gelthorpe] L.[ight] I. [nfantry] as their captain, but was made Col. & was acting Brigadier Gen. during the battle. Col. Johnson’s loss will also be much felt; he leaves a wife & eight children. A great many Charlestonians are wounded but only three of Kershaw’s R.[egiment] which must have been in the right wing…Rumors are, of course, flying in every direction, none of which are to be relied on, but Willie Heyward went on tonight to see after some of his friends, who he hears are wounded. July 23 – The telegraph today only confirms what we heard yesterday without additional information, as the wires from Manassas to Richmond were down for some hours. Several gentlemen went on last night with servants & nurses to attend our wounded, and societies for their relief are being organized in the city. The northern account of the battle & dreadful panic which seized their troops, followed by complete demoralization, is most graphic. They admit that the carnage was fearful. The “brag” regiment of N. Y., the 69th, was cut to pieces; the infamous Fire Zouaves went into battle 1100 strong and come out 206. The New Orleans Zouaves were let loose on them & most amply were the murder of [James] Jackson & the outrages on women avenged on these fiends; 60 pieces of artillery were taken including Sherman’s which was celebrated as Ringgold’s during the Mexican War[,] Carlisle’s, Griffins, the West Point Batteries, & the 8 siege 32-pounder rifled cannon, with which Scott was marching upon Richmond. The Federal army left Washington commanded by Scott in all the pomp & pageantry of the panoply of war – all so grand and impressive in their own eyes that they did not dream that we would strike a blow but would lay down our arms in terror. They carried 550 pair of handcuffs & invited immense numbers of ladies to follow and see Beauregard and Lee put into irons, expecting to march directly on to Richmond. The contrast of the picture may be imagined – gloom and terror reign in Washington, and they are multiplying fortifications and reinforcing the city. July 25 – Gen. McClellan has superseded McDowell, U. S., who was defeated at Bull Run on the 21st. He had telegraphed to Washington announcing a signal victory & by the time the news arrived his troops were routed and flying for their lives. Mr. [Robert] Bunch of the English Consul says he considers this one of the most remarkable victories ever gained. Not only were the Lincolnites double our number, but all their batteries were manned by regulars, well trained and experienced as well as commanded by experienced officers. Those batteries were almost all taken by infantry at the point of the bayonet, a thing which has never been done before – cavalry always being sent to charge them. The new French Consul, Baron St. Andre’, has lately arrived here. He was instructed to avoid Washington & to present his credentials to the Mayor, so at least we hear, and seems probable it is but the preparatory step to recognizing us. July 26 – [Aunt] Carrie [Blanding] & myself went up today to Mrs. [Anna Gaillard] White’s to bid Mary Jane and herself goodbye as they expect to leave at midday for Summersville on their way Winnsboro. We found a number of the Dragoons collected there, waiting the arrival of the bodies; the train was expected at eight and again at ten, but a telegram announced that a delay had occurred & it would not arrive till one. Mr. [John] White invited some of the dragoons to wait there instead of returning home. A funereal car had been sent to Florence to meet the bodies & another draped in mourning bore the committee appointed to meet it. Business was generally suspended, all the flags were at half-mast & the Liberty pole had crape upon it; everybody was out to see the procession. The Dragoons in their summer uniform of pure white, the German Hussars, & Charleston Mounted Guard met the bodies at the depot and escorted them to the City Hall, four from each company being detailed as especial body guard & the City Guard marching in single file on either side of the hearses; the bodies lay in state for three hours; at four the procession moved again, the Dragoons first, Col. Anderson commanding and leading the way, with nearly a thousand regulars trailing arms. The W.[ashington] L.[ight] I. [nfantry] was the only volunteer company carrying ars in respect to Col. Johnson, but every infantry company in the city turned out; the pall bearers were all high officers in brilliant uniforms, some on foot others on horseback immediately around the hearses; the flags were furled, at least some were, & draped in crape. There was but little music. The R.[utledge] M.[ounted] R.[ifles] ending the procession on foot leading their horses, a body of artillery in their way to Va. commanded by Willie Preston were also in the procession. Col. Bartow’s body had been escorted to the Savannah R. R. by the Mounted Guard. Carrie & myself dined at Mrs. W[hite]’s; then all went to St. Paul’s [Episcopal Church] where the services were performed by cousin Christopher [Gasden] except Mrs. W and myself – our carriage came for me, and she and I rode out to see the procession. We got a position at the head of Calhoun [St.], and saw it as it turned into Coming [St.] Many of the companies could not get as far as the corner. After the services were over, the bodies were brought out and three volleys fired over them. They were then carried to Magnolia Cemetery, where Col. Johnson was buried & Gen. Bee’s remains placed until tomorrow, when they would be carried to Pendleton where all his family are buried. Gen. Bee was mortally wounded in the stomach by grape or chain shot and did not die till eleven o’clock on Monday and , though he suffered fearfully he never uttered a murmur. Col. J. and Col. B. were both instantly killed, the former dreadfully mangled in the face. Thus it was impossible to allow the family a last look ere they were consigned to the tomb, & oh, how harrowing to their feelings to think those loved forms so near and yet unable to obtain one last agonizing look. July 29 – A letter was received from Rutledge today written from Stone Bridge on the 22nd. It was merely a few lines in pencil, telling us that the battle had taken place and that Kershaw’s & Cash[‘s] regiment had the honor of turning the tide of battle to victory. President Davis said they had done so. It was a mistake to say that he commanded the centre; he did not arrive till the enemy were in full retreat. To Beauregard belongs the honor of planning the battle & commanding the army – he has just been made a Confederate General. Col. Richard Anderson has been raised to the rank of Brigadier General. Cowen Barnwell says the road to Centreville was strewed not only with arms, knapsacks & soldiers’ clothing, but delicacies of all sorts and ladies bonnets and shawls. For, a great many Lincolnite Congressmen with their wives and friends had gone to witness the ‘great race’ between Federals and Confederates. One of the prisoners said they were told by their officers that we would not fight or at least it would be a mere brush, for our men were so few compared to theirs & they did not believe they would face the regulars, Scott’s chosen 10,000, but would yield or run and their army would march immediately on Richmond. The papers which were taken prove the man’s assertion true. A bill of fare among other things was found of a dinner McDowell intended to give yesterday in Richmond. [Alfred] Ely [of New York], a member of Congress, also Col. Corcoran of the N. Y. 69th, the latter was captured by a mere boy. The P[almetto] G[uard] have captured a flag & two drums. Every Southerner was a hero on that battlefield; every day we learn some new deed of valor, but the taking of Sherman’s battery at the point of the bayonet is the most wonderful. Beauregard said it was the greatest the world has ever seen. Our troops suffered awfully for want of water. Exhausted from want of food, & hard fighting, their thirst was intense and caused severe suffering. August 1 – Among other articles captured have been several wagons loaded with handcuffs – 30,000 pairs, to deck their intended victims. I suppose the Lincolnites expected to have a triumphal entry to Washington in the old Roman style. Some recent travelers announce that it is generally believed in the Confederate States than Gen. Scott was killed and the battle of Bull Run, and that the late Congress was held in Philadelphia. These are specimens of the singular delusions with regard to glaring facts, which prevail at the South. We cannot put down all these misapprehensions to the account of willful falsehood, for many of them prevail among good men known and honored and beloved in all the churches. I will mention a single case. Other statements as remarkable follow: The Rev. Dr. Col. Pendleton showed him 30 pieces of cannon in one place, among which was Sherman’s battery, which he (the Rev. Dr. Co. P.) had captured without the loss of a man killed or wounded. Now, it is known that Sherman’s battery was not taken, and that our total loss of guns was 25. “The killed and fatally wounded of the Federal army were 6,000, and the total of guns captured was 63.” On these statements I need not dwell, but finding, to my utter surprise, that the story of the manacles was believed by some intelligent a person as Dr. Andrews, I immediately proceeded to the War Department, to make inquiries on the subject. The Adjutant-General emphatically denied that there was any truth in the statement, and authorized me to use his name. I called also at General Scott’s office, and not being able to see him, stated that I wished an official answer from his office, in reference to this matter. In reply, his aid, Col. Van Ranselear, declared the he had himself made this inquiry of Gen. McDowell, who told him that he had taken one hundred pair of manacles, as a preparation for insubordination threatened in part of a single regiment, and that these were all they had, and this was the only purpose for which they were taken. And yet, an eye-witness on the spot had seen five or six thousand! And these five or six thousand “are being spread all over the South!” Doubtless, these clanking manacles will produce all their intended effect there, but it is much to be doubted whether an appeal for peace to the churches of the North will be very effective when based upon facts such as these. A friend recently visited the Theological Seminary, and found it (appropriately) in the possession of a New York regiment. He states that scarcely any injury has been done to the buildings, and that the grounds are kept in better than their usual order. The Colonel has strictly forbidden all depredations on private property, and recently discovering one of the men milking a cow, fired his pistol at him. The lofty tower of Aspinwall Hall is regarded as a very important out-look. Gen. McClellan, on a recent visit, considered whether the building should not be made his headquarters on the Virginia side. Whether or no it was in consequence of recent rumors that Beauregard was about to occupy Alexandria and Washington, my friend could not tell, but his attention was directed to the fact that the trees on Shooters Hill had been so cut away that two great guns were pointed directly upon Alexandria from Fort Ellsworth, and two others upon the Seminary; and that pains were taken to have these facts known rather than disguised. Most earnestly do we hope that no “military necessity” may bring them into action. Alexandria has already suffered all that even an enemy could wish, and more than enough to make friends, who have pleasant and sacred associations with the place, to weep. Indeed, one recent incident, which illustrates how unnatural anger gives way in a Christian heart before habitual benevolence, would plead not in vain, if it were known, for the preservation of the city. A strong Secessionist, who had been heard to say that he would not give a cup of water to a dying Federal soldier, had his feelings of pity and magnanimity so raised by the spectacle of our poor, fugitive, wounded, exhausted, and hungry soldiers, as they poured into Alexandria, that he exerted himself to the utmost for their comfort, and actually provided about 400 dinners for them at his own expense, before the day was closed. I rejoice to record this incident. Are there not many of our impulsive Southern friends whose talk is full of ferocity before the battle, who will exhibit a similar kindly reaction when it is over? There was much unpardonable and ferocious hatred exhibited in repulsive forms of cruelty at Bull Run, and the testimonies to this effect are too numerous and undoubted to be forgotten or denied; but there have been also many kindly courtesies shown to the prisoners at Richmond. May not war, with the mutual respect and the high courtesies to which it shall give birth, bring about the reconciliation and fraternal peace which the irritating strife of politics never could produce? I find the Confederate prisoners regard such a suggestion as wild delusion. But who ever, under a strong passion to-day, could be made to believe in the reaction which will take place to-morrow? Yet they who witness a flood-tide, as it comes tumbling in and raging and foaming on the rocks, in the evening, may see it, spent and still, slowly receding from the late lashed shore, in the calm morning. Washington is singularly calm. Some strange spirit of subordination has possession of us all. We are growing modest and distrustful of our ability to plan campaigns. We have ceased to insist upon a victory to-morrow. While, on the one hand, we ache for a success which shall be decisive, on the other, we dread to express the feeling, lest it might have a feather’s pressure in hastening an attempt before success would be morally secure. In the meantime, we see and hear scarcely any troops, but we meet long, long trains of wagons in the avenues; we see whole herds of horses and mules on some side-lots in the neighborhood of the city; and those who are wakeful at night, think they hear the measured tramp, as if many men were marching without music. I have heard great Canterbury Cathedral organs giving out grave and majestic music, but the sound of a regiment’s march, in a still nigh, over the Long Bridge, with the thought of what soul-working and heart-working accompany it, and make its measured fall awful, is to me more moving and magnificent than that. You will gather more of the details from papers than I can give you except that it is a fact that they brought a large number of handcuffs. I am told a box of them was marked for Officers –My brother told me he saw one numbered 500 or some such number but I am told there were thousands[.] A circular has been sent from our Head Qrts. Inquiring into it. Mary Lee Papers, Virginia Historical Society, Richmond, Virginia MSS/L5144a 1334-1666 Sec. 24. Used with permission. The recent battle and the fate of our missing comrades, which we did not then definitely know, was the one subject of conversation. I recall an expression of one of my tentmates as we sat on the ground in the tent eating our dinners. “Well,” he said, “anyhow, it does seem good to have a roof over our heads and a visible means of support.” There was another thing connected with that, the second day after the battle, that has since caused me to feel sincere pride in the company. Every man not killed, wounded, or captured was ‘present and accounted for’ at the evening roll call, with his gun and equipments. A grown man of very ordinary capabilities ought to have known better. We did go out with confidence, but I heard no boasting by the soldiers themselves – but I do not claim to know what noncombatants may have done or said. There were no ropes, and I do not suppose that any soldier ever had a thought of providing one. Our flag was not in any sense ashamed of us, nor we of it. The colors had been bravely borne. All of the color guard but one had been wounded, and the flag itself riddled with bullets, but it was dearer to us than ever, and its display brought neither censure nor discredit to us or it. Every man of the company – and, I believe, of the regiment – had clung to his musket as a man overboard would cling to a life preserver. It is not my purpose to comment on the strategy or tactics at Bull Run or elsewhere, or the criticism that followed, but we know now that while the plan may have been good, it was most bunglingly executed, and later experience has shown the unwisdom of sending in a regiment at a time to be beaten in detail. It was really an absurd thing to do. I have often thought, too, what a glorious opportunity there was to have sent a brigade around our right flank at the time we were first engaged and taken their line and batteries in reverse. It seems now that it would have been entirely feasible and must have wrecked Beauregard’s army. But it is useless to ‘cry for spilled milk’ and – as ours was badly spilled – I leave this part of the subject without further comment. The official loss of the regiment as I find it is: killed 42, wounded 108, and missing 30. Many of the wounded and the missing were prisoners. I do not know the exact number of the regiment in the Bull Run Campaign. If we set it at 900, then the total loss of 180 men was twenty percent of the whole number. The strength of Company F when it left the state was 3 officers and 96 enlisted men. When we started on the campaign, Lieut. Hoyt and ten enlisted men were left at the camp. There were 2 officers and 86 enlisted men went out with the company. The loss of the company was: 8 killed or died of their wounds; wounded, 12; and missing, 3 – for a total of 23. The total casualties were 23 – more than twenty-five percent. Sergeant Charles N. Harris was one of the wounded. A rebel bullet shattered his shoulder, and he was captured and taken to Richmond. He recovered, was paroled, sent home, and finally exchanged. It was supposed at the time that he was dead, and, under that belief, his obituary was printed and funeral services were held. It was thus that he had an opportunity to read of his own funeral. Company F was not ‘spoiling for a fight’ when it started for Bull Run or on any other occasion, but it meant business, as it always did when confronting an enemy, and did its level best to make things interesting for its ‘friends, the enemy.’ It did not ‘move as steadily as if on parade’ or ‘march undismayed in the face of batteries’ or ‘smile at bursting shells’; but it did try to march wherever it was ordered; we were all more or less scared – and in my case it was more; we ‘dodgedi the shell on the hillside both going and returning; and all through the fight we fully realized that it was a serious business, and I have no doubt we ‘looked it.’ In a word, we fully understood that life and limb were in danger, and the fact impressed itself upon us – much as it would on anyone under like circumstances. The First Minnesota Regiment moved from its position on the left of the field to the support of Ricketts’ battery and gallantly engaged the enemy at that point. It was so near the enemy’s lines that friend and foe were for a time confused. The regiment behaved exceedingly well and finally retired from the field in good order. I may add, without injustice to any other command, that no other regiment in the brigade or division received such high commendation, and some were directly censured. James Wright Papers, Minnesota Historical Society, as quoted on pp. 64 – 65 in Keillor, No More Gallant a Deed: A Civil War Memoir of the First Minnesota Volunteers. Used with permission. A Mr. Brady, of Maine, raised a company and was chosen Captain. The Governor however would not appoint him Captain, the election by the company not being binding. This incensed the company. The Adjutant General, Hodson, advised the Colonel of the Regiment, Dunnell, by letter, to procure several dozen handcuffs, as he might want them, insinuating that there might be a bolt in his disaffected company. This letter fell into the hands of the rebels at Bulls Run and was published. They also state that they captured several thousand handcuffs. It probably all grew out of this singular letter, though the Portland (Me.) Argus says it was understood at the time that six dozen handcuffs were purchased for the 5th regiment, in which Mr. Brady’s company was. If you’re not already familiar with the rumors of Yankee handcuffs at First Bull Run, go here and get caught up (this article will be at the top of the page since it also carries a “handcuffs” tag – scroll down to the first article and read forward, if you get my drift). If you’re already hip, read on. Among our visitors who were numerous & mostly for curiosity, were a few of my old Army friends, generally polite but not one of them did me any good & some were insulting. Almost every stranger inquired, “What di you come down here for? Do you expect to subjugate us?” But, after all, it was from strangers that I experienced the most courtesy & most tangible comfort. Col. Lay, from the U.S. Army but now on Gen. Beauregard’s staff, came to inquire about the handcuff story which [had] created so much noise in the South. The story was that 30,000 handcuffs designed for the rebels were brot by Gen. McDowell & were captured. Both Ricketts & I denied it point-blank, & offered, if they could find them, to be the first to wear them. Lay afterwards came back & expressed Gen. Beauregard as satisfied, but to this day the tale never has been corrected, but has been kept alive to foment the passions of the South. So, this story of handcuffs seems to be just that, a story, one likely propagated to further demonstrate the dastardly nature of the Northern opponent. It seems unlikely that so many handcuffs could, first, be carried on to the field (they were big, heavy, bulky things and would have required dozens of wagons to transport) and second, have been completely lost to history, physically speaking. But what is the source of the story? How did “Gossip Zero” come up with the idea in the first place? Well, I may have stumbled across a clue in the book I’m reading right now. I picked up Carthage Must Be Destroyed: The Rise and Fall of an Ancient Civilization, by Richard Miles, because I had a hankering to learn about the Punic Wars. 142 pages into a 373 page book and the first of the three Punic Wars hasn’t even started yet. 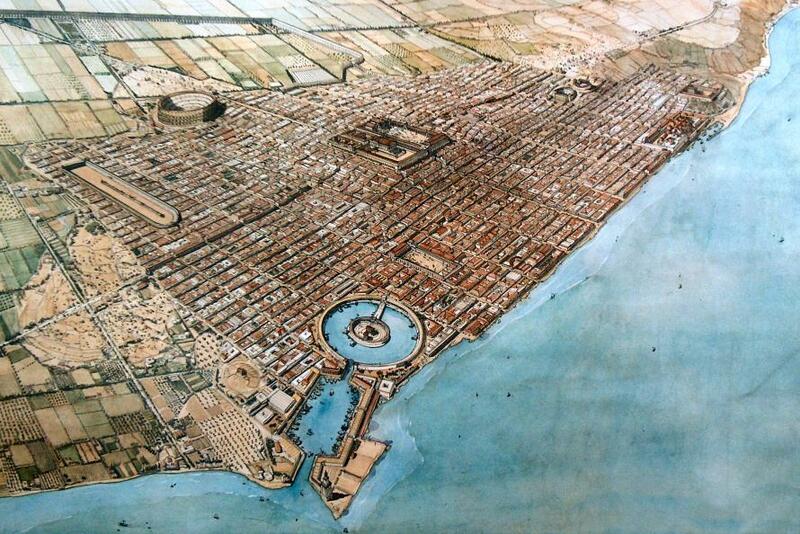 The Carthaginians are still going at it with the Hellenic cities of Sicily, mostly Syracuse. Hannibals and Hamilcars abound – what, are there only two names in Punic? It’s all very confusing, and the long string of Scipios haven’t even been introduced by the Romans. Needless to say, I’m learning a lot, but If you’re into ancient history you’re better served by Elektratig. In [Sicilian Greek historian] Timaeus’ account of the later wars between Carthage and Syracuse, the complex strategic reasons why it was important for Carthage to intervene militarily in Sicily, like those of the Persians in Greece, were reduced to little more than a wish to enslave Hellas [Greece], beautifully articulated in one episode by an apparent discovery of 20,000 pairs of manacles in the Carthaginian camp after a victory [by Agathocles of Syracuse, I’m guessing], or simply a hatred of all Greeks. Is this where the Confederates got the idea? Makes sense to me. It wouldn’t be the first time history was plagiarized in an attempt to stir up support. P. G. T. Beauregard had borrowed liberally from the rhetoric of the defense of New Orleans some 45 years earlier in his “Beauty and Booty” proclamation (the word then was that Sir Edward Pakenham had promised both to his men if they would take the city). Proving it, on the other hand, is problematic.